In an age of short attention spans, failing fast, and unicorns, Ryan Holiday has written a refreshing book about creating work that lasts. The advice in Perennial Seller applies to all creative endeavors, from building companies to writing books. It’s both realistic and inspiring. On my blog here, I review books about marketing and about writing. 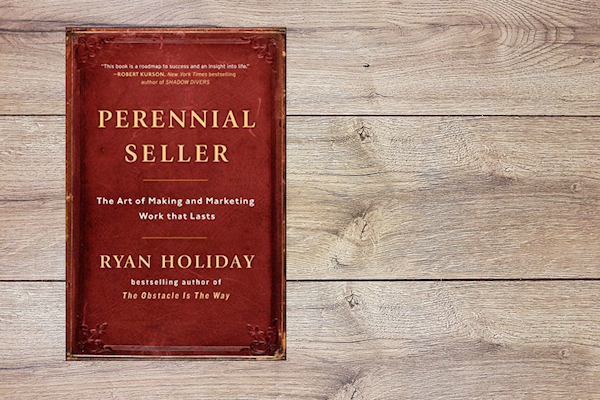 Perennial Seller, by Ryan Holiday, works for both groups. Holiday lays down the challenge right in the title – create something that keeps selling. He challenges us to do work that has a chance of lasting – perhaps ten years, maybe longer. Sounds obvious, right? But we’re surrounded by short-term thinking in every aspect of our lives. If you want to do work that matters, you may have to combine a long view with a great deal of work, a bit of faith, and a lot of luck. The book has four sections that mirror the process of creating work that lasts. This kind of commitment isn’t easy. It requires sacrifice, time, patience and effort. And there are no guarantees. Yet when reading a book I can tell, almost instantly, if the author was trying to create something that lasts, or something that fills a fleeting need, makes a quick buck, and disappears. It’s much more exciting, as a reader, to become personally invested in work meant to last. Part Two describes positioning – this is for the marketers among you! Positioning for the long-term requires that you focus on the audience needs rather than your own. Part Three covers marketing. Here, too, Holiday has terrific advice for book authors in particular about avoiding the obvious paths and choosing strategies that support sustained growth. In Part Four, building and maintaining a perennial seller’s platform is a job that is never done, nor would we want it to be. If we care about what we do, if we’re doing work that matters, then we must invest in the platform. For writers and potential authors, Perennial Seller offers realistic advice and motivation to work on your craft and create something meaningful rather than fast. For marketers, the book is an important reminder to focus on the long-term relationship with the customer. It’s hard to build a business that endures based on fleeting transactions. Ongoing customer relationships will give your business staying power.